Courtesy of Jannie at Rainbow Soap & Candle Mfg. This recipe is for a 16 oz- Shea Soother Blend. Use your Kitchen Aid, it makes quite a difference in time and texture of the cream. Crank up the Kitchen Aid to Whip and let it go for at least 20 minutes. Not adding water makes this cream really excellent because you don't need extra preservatives. The above blend was created to help the skin heal. To assist in adding tone and elasticity to the skin. It helps to decrease the puffiness and redness and strengthen the tissue. A tonic to tired, sore, chapped, calloused feet. This cream may also be applied to insect bites, or other areas of the body that can tolerate the icy-hot sensation of peppermint. Directions: Make essential oil blend at least 3 days ahead of time. 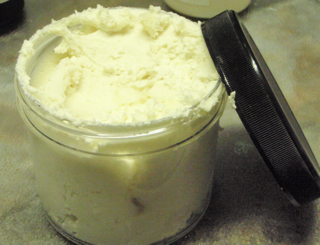 Place Shea butter in large bowl and, using the back of a large spoon, mash until it breaks down; slowly add all other ingredients to Shea butter and mix until oils are well blended. For extra creaminess: use a mixer (blend for about 15 - 20 minutes) or a food processor (blend for 5 minutes). Pour into desired containers and allow mixture 1 - 2 days to set up. This batch made: 5 - 4 oz jars plus a little left over. Method of use: Begin with a very small amount, (about the size of a pea), work in between fingertips until cream is pliable, apply to desired area. Repeat as necessary. Use 1 - 2 times daily, depending on severity of problem. Courtesy of Swift from the Point of Interest! Green avocado butter is a new ingredient to me, so the first product I generally make with a new butter is a whipped butter so I can consider the texture and greasiness and ability to whip and all those other things. So I made up a whipped green avocado butter with it! Sorry the picture isn't prettier but I ran out of piping bags! I melted the avocado butter and oil in my double boiler, then popped it into the freezer for about an hour. (It took a long time to set!) I added the fragrance oil, then I whipped the heck out of it with the whisk attachment on my mixers. It whipped up really nicely! It feels really lovely on my skin - like babassu oil, it melts on contact, which is always a good thing! It felt a little greasy at first (which I like) but quickly dried to a powdery kind of feeling. The one down side is that I found this product really earthy smelling, and I'm not a fan of earthy. (I can't stand patchouli - even having it in my workshop drives me nuts.) I had to up the fragrance oil to 3% to try to cover it up, and I can still smell it. I'm going to do some experiments with it at lower levels as I'm sure using it in something like a lotion bar or lotion will make it smell less earthy! Otherwise, it feels absolutely wonderful on my skin. I'll post more messages as I make more things with it!